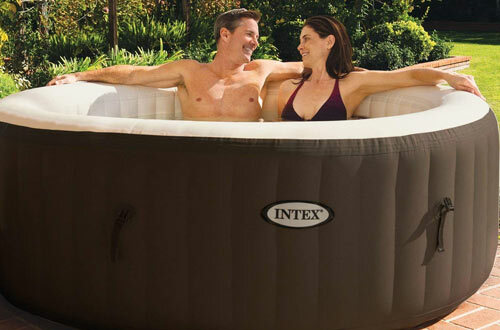 A portable inflatable hot tub is one is one of the best ways to unwind and relax in the comfort of your home. Spending time in a hot tub will for sure make you feel at ease and relaxed. 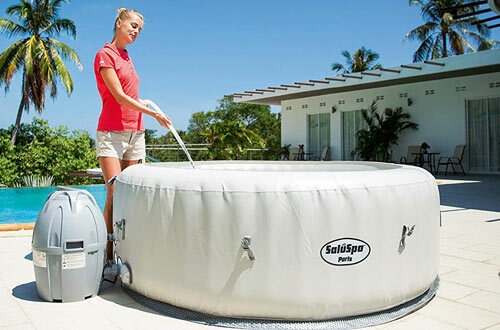 Portable inflatable hot tubs are ideal for use outside during the summer. 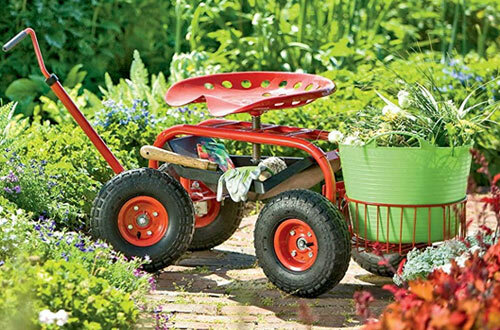 They feature a portable design for easy movement and storage. When choosing the best portable inflatable hot tub, make sure you choose one that is of high-quality material, easy to operate and well-cushioned to provide comfort. Of course, there are more features to consider, but we’ve done all the hard work for you. 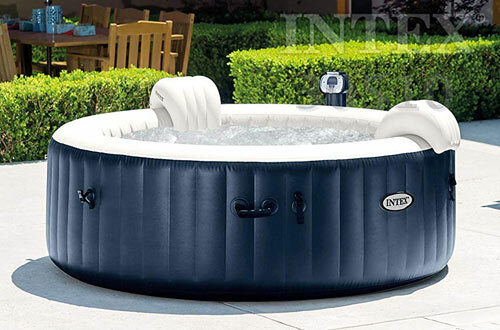 We’ve reviewed for you ten leading inflatable hot tubs on the market to buy this year. Read one and make sure you select one for a relaxing summer outdoors. This is the leading portable inflatable hot tub on the market with a built-in hard water treatment system. The tub softens hard water for a soothing experience. 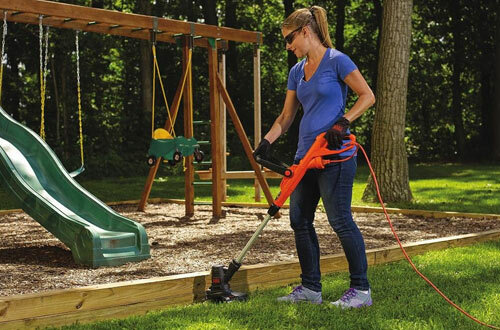 It also features an insulated cover that helps reduce heat loss while adding to safety. It is quite easy to maintain with two easy to replace cartridge filters. Overall, the Intex 77 is a quality hot tub with a three-way test strip, heating system, and two filter cartridges. It also has a seat capacity of four people and can accommodate 210 gallons of water. 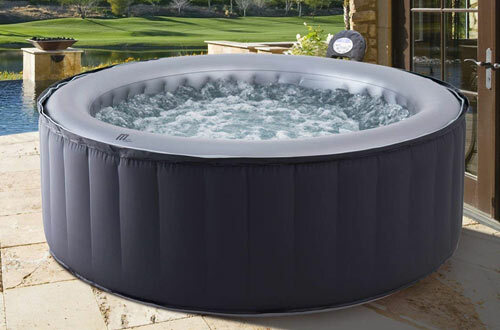 This is a much larger Pure Spa inflatable hot tub capable of accommodating up to six people. This hot tub is another pretty simple design that works on the touch of a button. It inflates fast and is ready for water in 20 minutes. It also deflates faster to allow for compact storage. 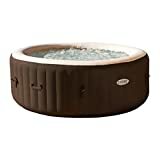 The hot tub features heated water with another soothing bubble jet for a relaxing experience outdoors. It is a quality selection that requires a simple two filter cartridge maintenance. 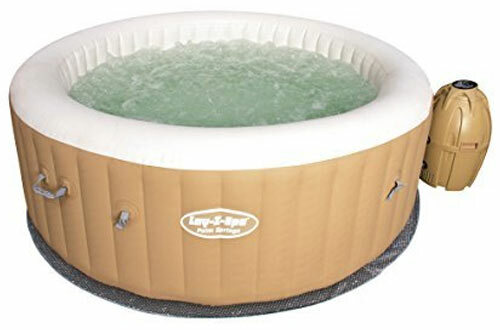 The Bestway inflatable hot tub is another high-quality selection with faster inflation using the spa pumps. The tub inflates fast without any tools and is ready for water in minutes. It features a rapid heating system and filtration system with a maximum 104 degrees F. The operation is also easy with simple digital control panel buttons. 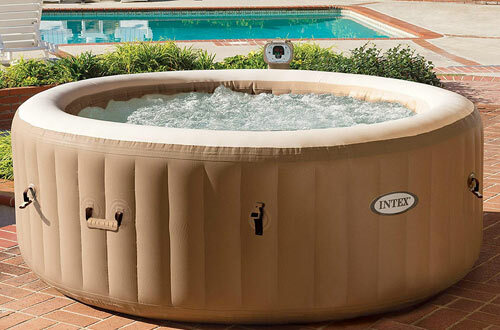 Overall, this is an excellent 2-4 person hot tub with a maximum water capacity of 177 gallons. 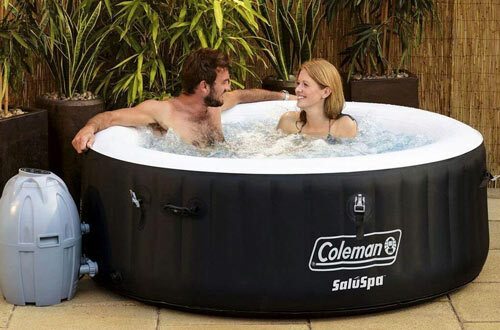 This is another sleek looking 4-person inflatable hot tub from Coleman. 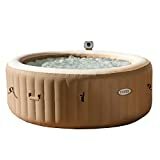 It is a quality tub with a heated water system and a set of soothing bubbles on the sides. The tub features a touch control panel for easy operation. It is a durable hot tub with fabric coated out walls for added safety and heat insulation. A further two lift handles help move the hot tub around with ease. 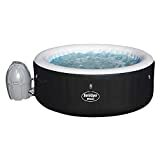 Overall, this hot tub is a great buy with two-easy-to replace filters for maintenance. 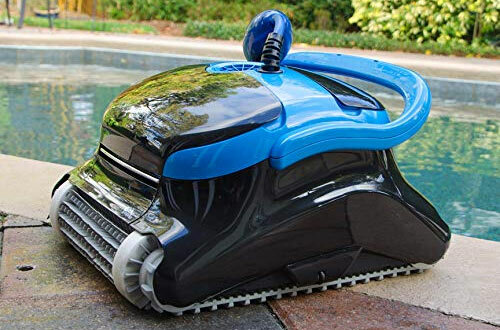 The Goplus portable inflatable hot tub is a user-friendly design with a digitally controlled pump for easy operation. The tub features a soft touch control panel that allows for easy temperature setting. 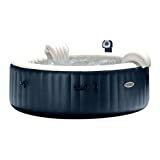 It is a durable tub with a superior fabric coated outer wall that retains heat. The heating system is secure and improved for efficient heating. A further built-in hard water softening system helps deliver a soothing experience. Maintenance is simple and provided through two cartridge filters that are easy to replace. 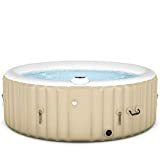 Overall, Goplus inflatable hot tub comes with all the required accessories for easy installation and immediate use out of the box. 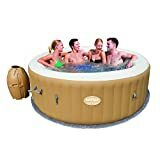 This is a much bigger Bestway hot tub than the one we’ve reviewed above but one ideal for 6-persons. It is an excellent choice when you have friends around. The tub features easy setup and faster inflation without any tools. It also features excellent water filtering system and rapid heating with a maximum temperature of 104 degrees F. The digital control panel is quite easy to operate and features an automatic on/off timer. The 4-Person Intex Inflatable Bubble Jet Hot Tub is another quality selection that installs and inflates fast. The tub is usually ready for water in 20 minutes letting you enjoy the warm soothing. It operates easily allowing up to 4 people to relax at the touch of a button. The tub features a high-speed 120 bubble jet for a refreshing massage. The construction of the tub is one of the most durable featuring a puncture resistant3-ply material with fiber technology. The entire package comes with a ten-watt hard water system, heating system, two-filter cartridges and much more. 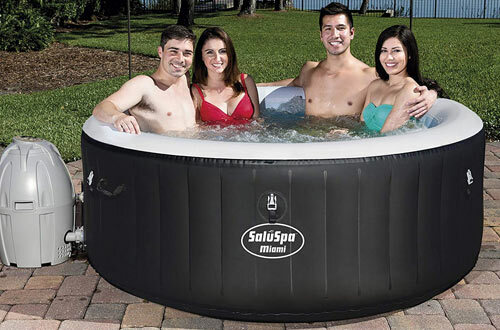 The Bestway SaluSpa 4-6 Person capacity hot tub is another highly rated pick that you have to consider buying. It is a quality hot tub with sturdy construction and LED light cycles that show you seven colours. The tub features a fast and easy setup that is ready for water in a maximum of 20 minutes. 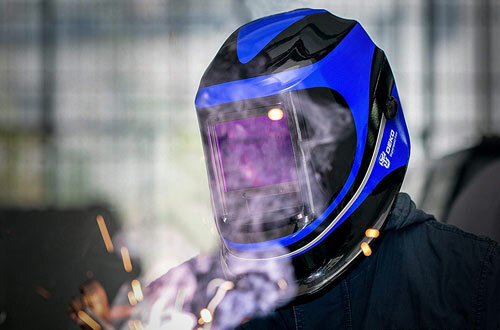 A digital control panel allows for easy use while a timer function offers automatic on/off. With a 250-gallon water capacity, this tub is a great addition to any family. 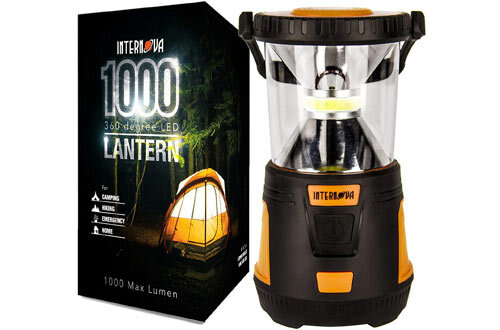 This is a pretty new product on the market but on with excellent features that will offer the ultimate comfort outdoors. It is a highly portable tub that can be used anywhere with easy inflation. The tub set-up in minutes and is ready for water in no time. 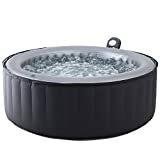 It is a durable tub featuring charcoal grey rhino six layer PVC material. This keeps the heat inside and adds to your safety. You also get to enjoy a refreshing massage through air jet bubbles the surround the tub. 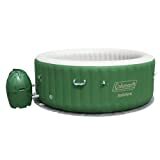 The Coleman hot tub is our final pick and an excellent one with heated water that is surrounded by a jet of refreshing bubbles. It is a quality tub featuring an easy to operate the digital control panel. The tub also features a timer function for automatic on/off. Overall, this is a large capacity 4-6 person tub with a durable Tritech fibre construction. When it is time to relax and unwind, getting the best portable inflatable hot tub means everything. These are the best portable inflatable hot tubs that you can use anywhere you go. 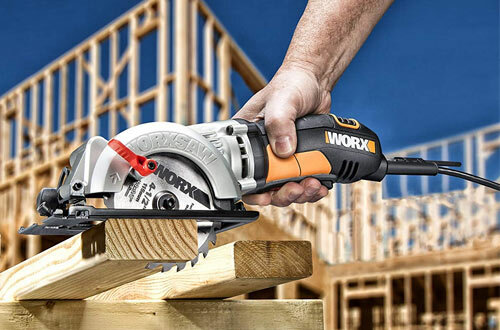 They are all quality and made to the highest standard with safety features.